alrighty, the trusty random number generator has come through - the recipient of the simplicity dress pattern is lin and the built by wendy shirt pattern will be going to bianca jae! email me your addresses, lucky ladies, and i'll send those out to you next week. thanks for playing everybody, i got to peek into some fun new-to-me blogs from the comments. vintage sheeting scraps that i had started to piece together for a quilt top, i wasn't completely happy with the way it was coming together so i put it away. that would bring my current quilt in progress total to seven. SEVEN. my sewing room looks like a fabric bomb went off in it. seriously. Fabric bomb-what a fabulous mental image! Hi Leslie, love your blog, its a huge inspiration to me! This comment not related to the entry (sorry, I didn't know how to contact you otherwise, feel free to delete this after reading) I thought you might like to know that your blog link to Chara Michelle, goes to some wierd site (advertising plenty of nasties). Keep up with the inspiring work! 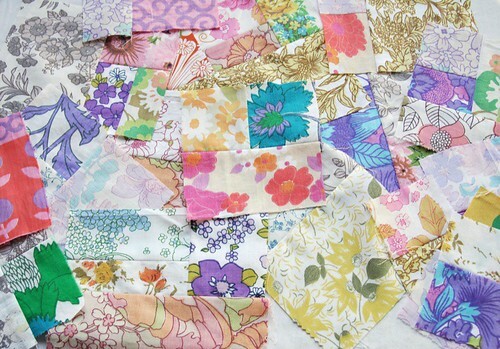 I love the vintage fabric you are using on those pieces. There are a lot of colors and patterns so it would be hard for me to come up with something too. Hope you find some inspiration.